The PVX 12 passive loudspeakers deliver superior sound quality by utilizing advanced materials like its lightweight, roadworthy molded polypropylene exterior. 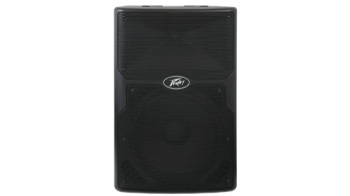 Lightweight, durable and voiced for live music or speech applications, these two-way speaker systems will handle 400 watts program and 800 watts peak power and feature heavy-duty woofers, 2-3/8" voice spindles and the Peavey RX14TM 1.4-" titanium diaphragm compression driver coupled to a constant directivity horn. Top, bottom and right side flying point inserts. Full-coverage heavy-duty perforated steel grille, with powder-coat finish. WaveguideTM Technology - 100Âº by 50Âº coverage. 15Âº upward and 35Âº downward directing sound to your audience. RX14TM - Titanium Compression Driver. Weight Unpacked: 37.00 lb(16.783 kg). Weight Packed: 43.00 lb(19.505 kg). Width Packed: 20"(50.8 cm). Height Packed: 26.75"(67.945 cm). Depth Packed: 18.25"(46.355 cm).